As a member, you'll be able to store your favorite Pepperidge Farm® Puff Pastry recipes in your personal Recipe Box. Plus, you can receive Inspiration, our monthly e-newsletter. First Name: Last Name: Email Address: Password: Password Confirm: Postal Code: Send me the e-newsletter Puff Pastry Inspiration. Enter your email address and press SUBMIT. 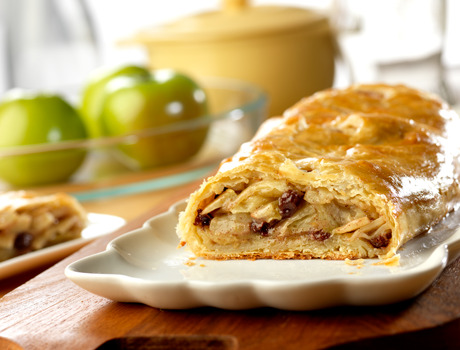 Your family will enjoy the homemade taste and old-fashioned goodness of this delectable apple strudel. It's made with prepared puff pastry, so it's easy and delicious. Your Reminder Has Been Set! Heat the oven to 375°F. Beat the egg and water in a small bowl with a fork. Stir the granulated sugar, 1 tablespoon flour and cinnamon in a medium bowl. Add the apples and raisins and toss to coat. Sprinkle the remaining flour on the work surface. Unfold the pastry sheet on the work surface. Roll the pastry sheet into a 16 x 12-inch rectangle. With the short side facing you, spoon the apple mixture onto the bottom half of the pastry sheet to within 1 inch of the edge. Roll up like a jelly roll. Place seam-side down onto a baking sheet (this will help keep it from unrolling during baking). Tuck the ends under to seal. Brush the pastry with the egg mixture. Cut 4 deep slits in the top of the pastry. Bake for 35 minutes or until the pastry is golden brown. Let the pastry cool on the baking sheet on a wire rack for 20 minutes. Sprinkle with the confectioners' sugar, if desired. For some nutty crunch, 1/4 cup sliced almonds may be added with the apples and raisins. For best results, make sure to toss the apples and raisins until they're evenly coated with the flour mixture. The flour helps to thicken the juices released by the apples as they cook. For a Vanilla Sauce to serve with the strudel, stir 3/4 cup milk, 1/2 cup light cream, 1/3 cup sugar, 4 egg yolks, beaten and 1/2 vanilla bean in a 2-quart saucepan. Cook and stir over medium heat until the mixture boils and thickens. Remove the saucepan from the heat. Cover and refrigerate for 1 hour. Remove the vanilla bean. Any leftover sauce is delicious over fresh berries or ice cream. For Pear and Cranberry Strudel, you can substitute Bosc pears and dried cranberries for the apples and raisins in this recipe. Watch a how-to demonstration of this recipe technique. Watch the demo to see how to make this type of recipe, then consult your recipe for specific instructions. Puff Pastry works best when cold. So chill your tools—knife, pastry/pizza cutter, cookie cutters, even pastry board and baking pans in the fridge - while thawing your pastry. Always flip and place the cut side of the Puff Pastry down on the baking sheet. Have a unique twist on this recipe or comment you’d like share? We may feature your twist on our homepage. We’ll include your first name, last initial and profile picture from Facebook. How do you make this recipe your own? Find them in your grocer’s freezer aisle!